After 18 months of construction, West Eau Claire Park is complete. 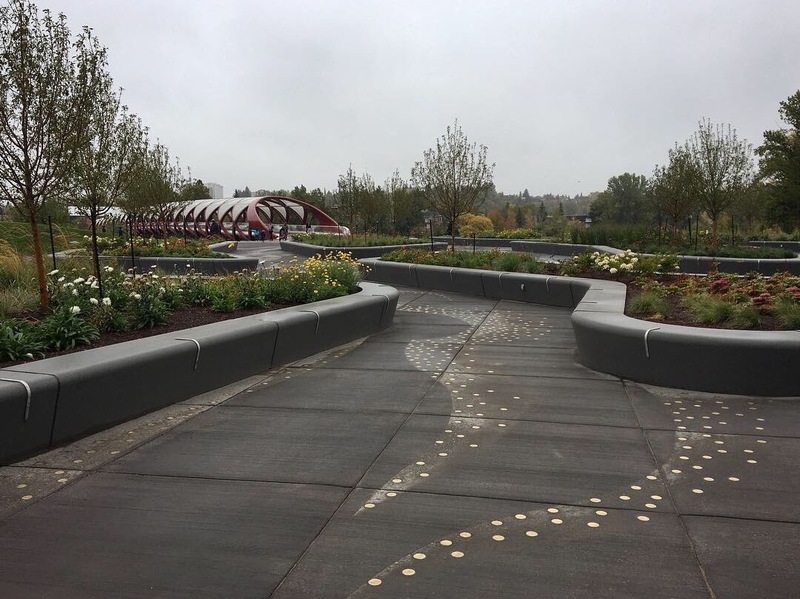 The public can now access the park gardens, public art, revitalized pathway and separated cycle track, all with the reassurance of flood mitigation built into the park’s design. Below, we’ve compiled an overview of the project including details on flood mitigation and information about related projects planned for the area. The total cost of the West Eau Claire Park is $10.6 million, which includes construction for park space, flood mitigation, cycle and pedestrians pathways, public art, stormwater infrastructure, lighting and landscaping. Flood mitigation efforts account for approximately 30 per cent of the total cost. 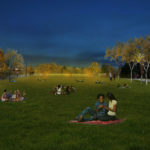 Ward 7 Councillor Druh Farrell explained that the upgrades were funded by a mix of private, city and provincial dollars. She said area developer Concord Pacific chipped in, and money from the Eau Claire Improvement Fund was also used to accent flood mitigation funding. 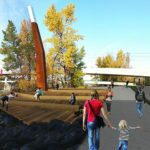 “We wanted to ensure the flood protection of Eau Claire was seamless and appeared as part of the design,” said Farrell. 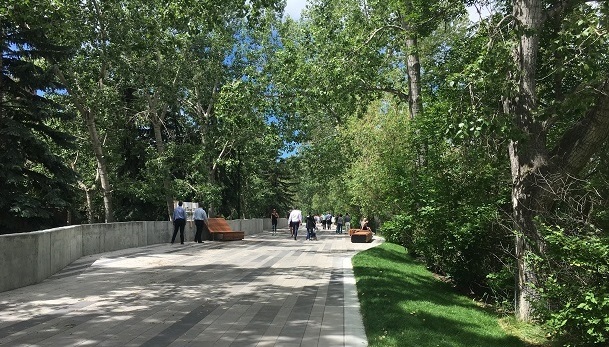 West Eau Claire Park stretches along the Bow River from Eau Claire Market to 10th Street SW and has two focal points: the Delta Garden and the Cove. The Delta Garden is located at the south end of the Peace Bridge, and forms an architectural delta to move people through the park. 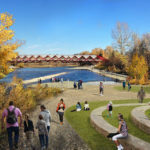 The Cove is a terraced seating area, to the east of the Delta Garden, where people can linger and relax on Muskoka chairs, while taking in the panorama of the Bow River, Peace Bridge, and Delta Garden. The Eau Claire Promenade runs through West Eau Claire Park to the Eau Claire Market and pedestrian and cycle traffic has been separated, with a new cycle track running behind the benches. So where is all this flood protection we’ve been told is built into the project? 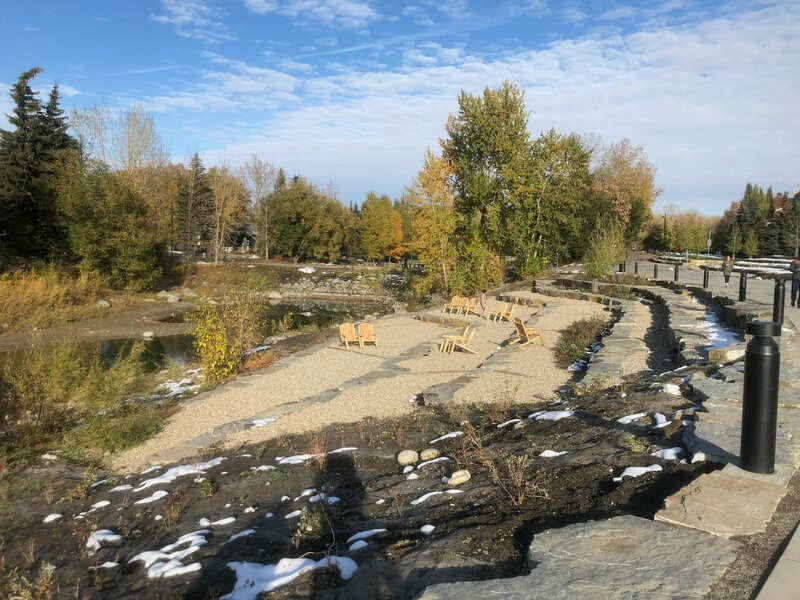 Though only 30 per cent of the total project cost was dedicated to flood mitigation, flood protection was considered throughout the design process. The construction of a cement flood wall and raised components helped to achieve 200-year flood protection in the park. 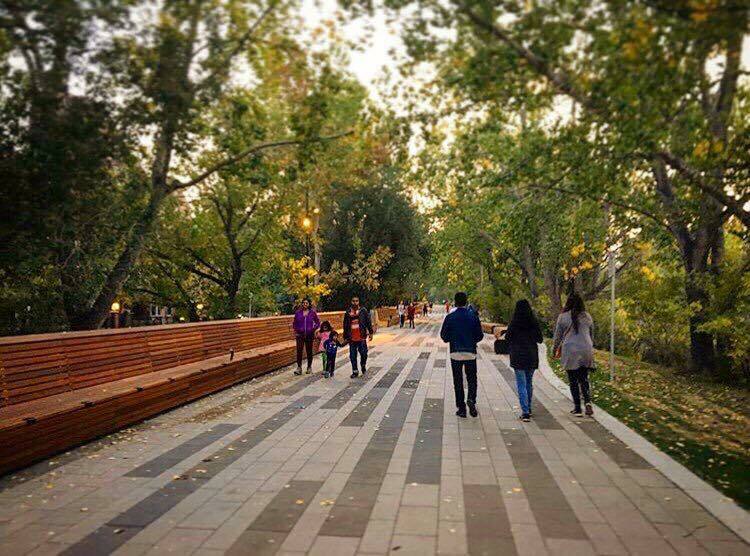 The 1-meter high cement flood wall has been hidden under wooden benches that run the length of the promenade. Pedestrian entry-points in the flood wall will be addressed with temporary aluminum stop-logs. 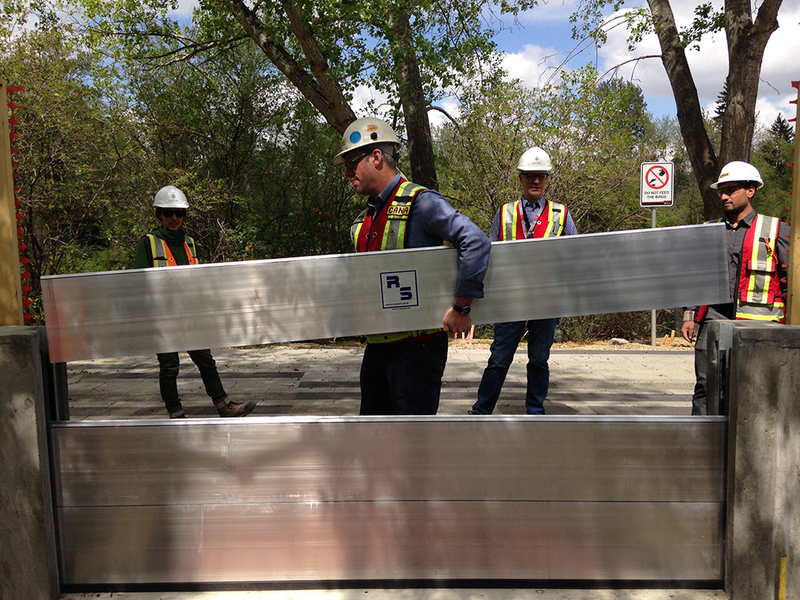 Similar technology has been used on the newly constructed zoo flood barrier and Centre Street Bridge flood barriers. Landforms have also been designed with temporary flood barriers in mind, such as the example below in the Delta Garden. To put this level of protection into perspective, in 2013 the Bow River saw flow rates of up to 1,840 m3/s; nearly the level of a 1:100-year flood. With the new protections now in place, West Eau Claire Park could withstand a 1:200-year level flood. The protection this project offers is very welcome, however, it is just one piece of the larger flood mitigation pie. There are still many areas of the Bow River (and the Elbow River) that expose the downtown core and Calgary communities to flood damage, and we must remember that without upstream mitigation on the Bow River our city remains at risk. The completed West Eau Claire Park we see today is phase one of a two-phased project and is just one of many projects planned for the area. 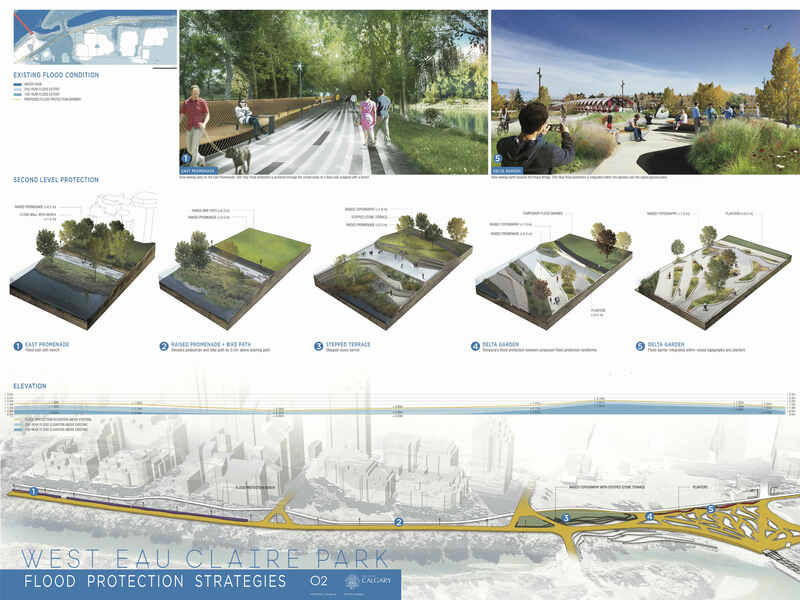 Additionally, the Eau Claire Public Realm Plan, which seeks to develop the area for forthcoming projects such as the Green Line and the redevelopment of Eau Claire Market, has identified projects stretching south along 3rd & 2nd Street SW and east to the Reconciliation Bridge. 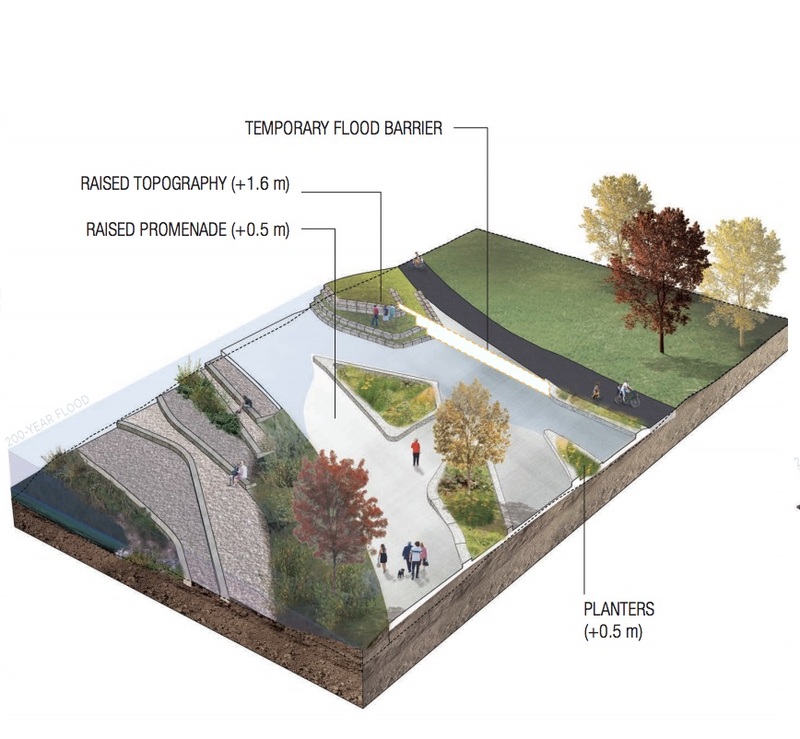 Flood mitigation measures and strategies used in West Eau Claire Park will be extended east, with Phase 2 of the Eau Claire Promenade (also called the Downtown Barrier) extending from Eau Claire Plaza, through the Centre Street Bridge, to Reconciliation Bridge. Phase 2 of the promenade is currently in design with anticipated completion in 2021. The latest information on this infrastructure is outlined in the December 2017 public information session. Flood mitigation measures must be incorporated along this section of the Riverwalk. Impacts to the existing pathways and amenities should be avoided to preserve the recent capital investment.